The BMW i3 is a compact hatchback that's sold as an electric car or a range-extended electric car—but don't call it a hybrid. The range extender is a small 2-cylinder motorcycle engine that recharges the battery but doesn't directly drive the wheels. With the i3, BMW launched a vehicle very different from its carefully honed traditional lineup of sporty sedans and crossovers. It's so different, the i3 got its own sub-brand. The i3 was the first entry in what the brand is making a range of "BMW i" vehicles, joined initially by the i8 hybrid sports car. In 2018, BMW added a sport-ish i3s version that boosted power by 14 horsepower over the regular car. Its battery grew in 2018 and 2019, up from 22 kwh in 2017 to 33 kwh in 2018. In 2019, the battery was rated for 42.2 kwh and 153 miles of electric range. 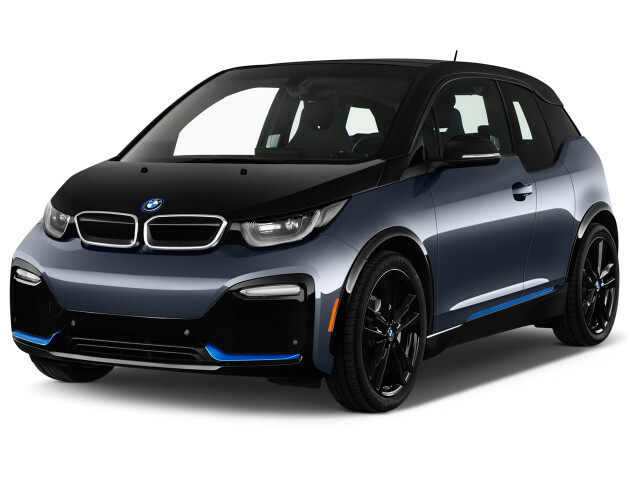 The shape of BMW's i3 is unlike that of anything currently within the BMW or Mini fold because it's been conceived as a dedicated electric car. The i3 is offered in several different Worlds, as BMW calls the model's trim levels. The i3 can trace its roots to BMW's MegaCity concept car. The architecture that concept spawned is called LifeDrive—it's a passenger (Life) module set atop a powertrain (Drive) module, for a modern twist on the old body-on-frame idea. In a first for a mass-produced vehicle, the passenger cell is produced from carbon-fiber-reinforced plastic, while the rolling chassis is made of aluminum. The i3 is designed and styled for urban environments. The tall hatchback has plenty of glass all around, though short rear glass compromises rear vision. The rear doors are hinged at the rear to keep it short and provide a coupe-like look. Like the iconic Toyota Prius and the more recent Nissan Leaf, the BMW i3 is instantly identifiable—with looks that provoke strong reactions, one way or another. The i3 is primarily an electric car, with a 170-horsepower (184 in the i3s) rear-mounted electric motor system providing 97-114 miles of driving range. Separately there’s the option for a REx—a 650cc gasoline 2-cylinder engine making 38 hp. In the BMW i3, the REx only functions to provide electricity, not supplemental tractive power, like in the Chevrolet Volt. With its tiny 2.4-gallon fuel tank and an estimated 33-42 mpg, it nearly doubles the effective range to 180 miles, curbing range anxiety to an extent. The i3 will charge fully in about 4.5 hours at 220 volts, or get to a full charge in 30 minutes using an SAE standardized DC fast-charger. The lithium-ion battery that powers the i3's rear-mounted electric motor is sandwiched into the car's floor. Initially, the battery's capacity was 22-kwh, but a 33-kwh variant was added for the 2017 model year and became standard for 2018. The body is made of carbon-fiber reinforced plastic (CFRP), so strong that there are no pillars required between the front and rear doors on each side. Although modest, the system's output is enough to move the i3 in a sporting way; BMW claims a 0-60 mph time as low as 6.8 seconds, and the little city car can top out at 99 mph. 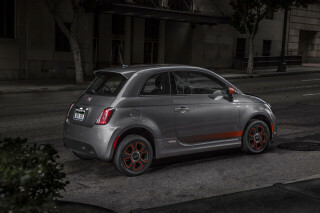 The rear-drive layout and near-50/50 front/rear weight distribution help it to outdo the dynamics of other small electric cars, although the tall body, boosted electric steering, and skinny tires all work to the detriment of handling. The weight-saving measures also pay dividends here, as well as with energy consumption. The i3's tall and narrow tires measure 155/70R19 and are of the low-rolling-resistance variety to improve mileage. The i3s gets 175/55R20s up front and 195/50R20s at the rear; still skinny, but handling is improved thanks to the extra traction and a 0.4 inch lower ride height. The i3 has a very upright cabin layout that helps make the most of available space. Cabin upholstery includes recycled materials—even the wood has been sustainably sourced—and with the tall roof, there's just enough space for adults in back. Four different trim levels of the i3 are offered, although BMW has chosen to call them Worlds instead. They include the Deka World, Mega World, Giga World, and Tera World. Navigation, ConnectedDrive, LED headlights and running lamps, an alarm system, and a 7.4-kw charger are included on all levels. The Giga World adds leather and wool upholstery, contrast stitching, and satellite radio, while the Tera gets special trims, a full-leather interior, and its own unique wheels. Beyond the trim level and a few color choices, BMW offers few options or packages offered on the i3. Pricing in the U.S. started at $42,275 when the i3 went on sale in May 2014. After a short initial model year, the 2015 model arrived with few changes—heated seats, satellite radio, and the DC fast-charge port were made standard, and base prices rose about $1,000 as a result of the added equipment. For 2017, the big change was the availability of a higher capacity battery that extended the electric driving range from about 90 miles to up to 114 miles. Additionally, the REx's fuel capacity was increased from 1.9 to 2.4 gallons. This vehicle may have some redeeming (BMW) qualities, but it sure isn't the appearance. It is UGGGGLY! Who would have thought it possible from BMW? This will be the last car I ever buy! Back in 2005 or thereabouts, I lived in Rockhampton, Queensland, Australia. When the Toyota Prius became available there, I leapt at the chance to buy this game changing 'green' car. I bought my second Prius... Back in 2005 or thereabouts, I lived in Rockhampton, Queensland, Australia. When the Toyota Prius became available there, I leapt at the chance to buy this game changing 'green' car. I bought my second Prius when I shifted back to New Zealand in 2010, as it was still the coolest greenest car on the market. I still have it (now done over 101,000 km and still going strong). But - I seldom drive it now. About a year ago, I became one of the first New Zealanders to buy an even bigger game changer and an even 'greener' car - the BMW i3 (Rex version). After a year, with 19000 km on the odometer, I still can't believe my good fortune. The car has won a swag of awards (try Googling them!) and every one of them richly deserved. Funky in style, incredibly responsive to the pedal, this is a dream car to drive. I've even had it on the local racing circuit - over 200metres against a souped up Subaru WR-X, the latter pipped it, but only just! Not bad for what my Ferrari racing car driver called a 'mum and dad' car.